When it comes to long term social media referral traffic, Pinterest is the king. The shelf life of a Facebook post is between 3-24 hours. A Pinterest post can essentially drive referral traffic forever. I have pins from three years ago that get more traffic today than the day I posted them. 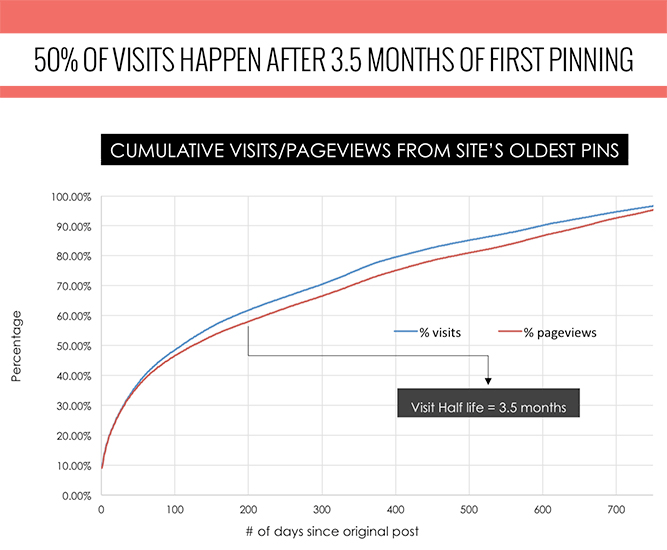 Piqora did a study and found that the half-life of Pinterest traffic is 3.5 months, and 40% of the overall traffic from pins occur between month 4 and 24. Over the last two years, I have studied and applied the techniques of the most successful Pinterest accounts. In this time, I have built my monthly Pinterest referral traffic to over 15,000 visitors. Are you ready to become a power pinner that receives a boat load of residual referral traffic from Pinterest? The most effective way to boost the amount of traffic and interaction that your Pinterest account sees is by increasing the amount of times that you post per day. When people consistently see your posts and profile in their feed, they are much more likely to share and take notice. 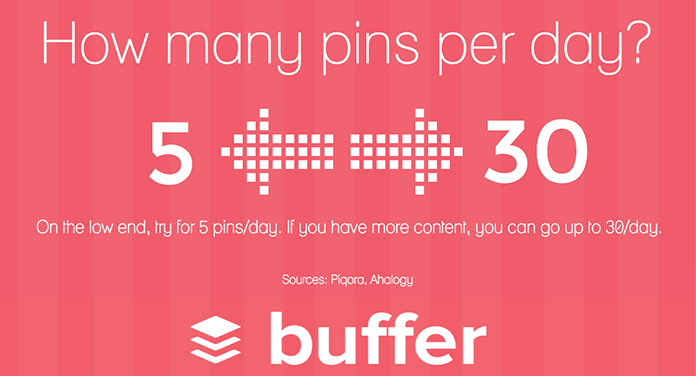 Buffer researched two Pinterest studies by Piqora and Ahalogy, and they found that posting at least 5 times a day had the biggest impact. While you should definitely be posting many times per day, try not to do it all at once. When you post over and over in a short period of time you crowd your audience’s newsfeeds, and they are much more likely to unfollow you. Colors, compositions, and subjects are key factors that influence total Pinterest engagement. For example, pins that are composed of light colors are 20% more likely to be repinned than those that have dark colors. Curalate examined 500,000 images on Pinterest and found 8 traits that lead to an image getting repinned more often than others. Pinterest allows you to pin posts to your own boards, and you also have the ability to join group boards. These are boards that multiple people can post to, and appear to each one of their followers. This lets you reach a much larger audience. The best way to find Pinterest groups with large followings is to use the website PinGroupie. You can browse the groups by most followers, repins, and even search for specific keywords. With each and every social media platform, there are certain times that more users are active. Knowing these times can be very powerful because you’re posts will be seen by more people and gain more engagement. There are a variety of tools that you can use to assess the optimal times for you to post. 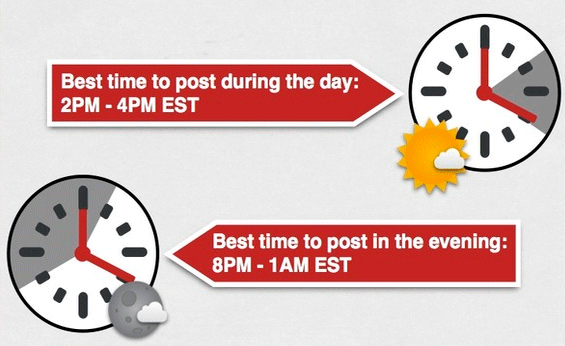 MyCleverAgency found that the best times to post on Pinterest were 2pm-4pm (EST) and 8pm-1am (EST). The worst time to post was from 5pm-7pm (EST). Integrate all of your social media accounts and spread the word of your Pinterest posts to everyone. Followers on other platforms will gain interest and end up following you on Pinterest. A study by Pew Research Center identified that Instagram users have the highest percentage of participation on Pinterest out of all the major social networks. Repinning is one way to show up in user activity feeds, but liking works just as well. If you come across content that doesn’t necessarily fit the niche that you are posting for, you can like it by hitting the heart button as opposed to repinning it. Likes show up in your activity feed just like pins do, and this can help persuade people to check out your boards and follow you. You can schedule your posts to certain times of day, and get all of your pinning for an entire week out of the way quickly. This makes Pinterest a relatively hands off activity that is still very powerful for your marketing. ViralWoot is my favorite out of the three. Your description can be made of very powerful text that can add to the over all effectiveness of the post. Adding a call to action has proven to increase a pins popularity by as much as 80 percent. Simply add in some words like “Pin this to your own technology board” at the end of your description. You can also create an image that has the call to action built directly into it. You can use keyword research to identify the phrases that Pinterest users are searching for and incorporate those keyword phrases into your pin. Use SEMRush or Google Keyword Planner to identify keywords that people are searching for that are related to your image. Use the target keyword phrase in the image name. Incorporate the target keyword phrase into the pin title and the description. If your blog posts are already optimized for Google search, then “rich pins” will automatically pull the title and description from any pinned image within a blog post. Rich pins is a free feature that is offered to Pinterest users. It allows you to create pins that contain more information than a normal pin. You can add prices, direct links to purchase, maps, and more detailed specifications about products. 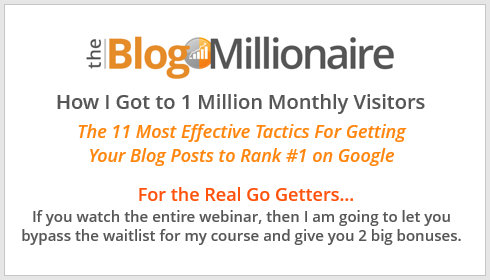 I set up rich article pins on my blog, and my traffic increase by 500% almost over night. Once you connect your domain to a Pinterest account, you just need to add a piece of code to your blog. Then every pin that is tied to a post is automatically updated with the titles and descriptions of your posts. The details of an infographic are usually not legible within the news feed. This leads users to click on the thumbnail to see the larger version. Take your time in coming up with a good pin title because that will greatly influence the click through rates on infographics. If you want to take it a step further, then you can create a special version of the infographic just for Pinterest. Remove the bottom half of the infographic and replace it with a call-to-action that reads “click here to see the entire infographic.” If the pin is linked to your blog post, then the visitors will be taken there when they click. 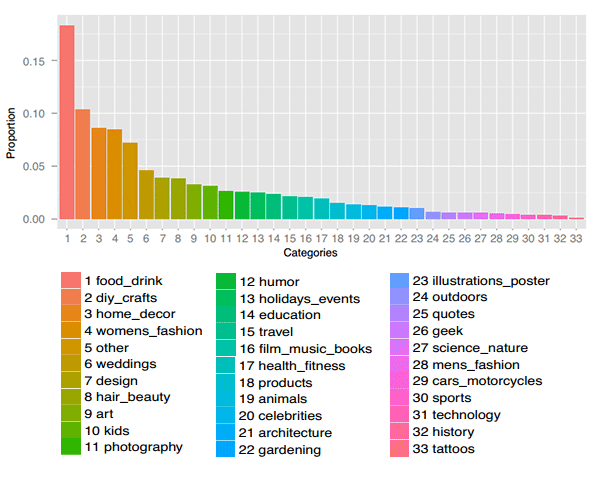 Georgia Tech studied 989,000 pinners in an effort to find what drives activity on Pinterest. They found that there were certain words that resonated most with Pinterest users. 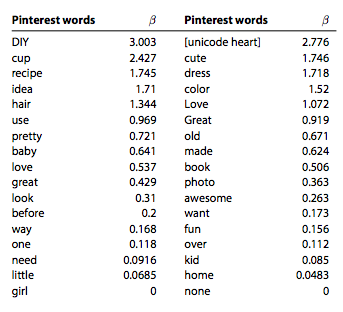 The top seven Pinterest words were DIY, the symbol for a unicode heart, cup, cute, recipe, dress, and idea. The top action verbs were use, look, want, and need. Pinterest gives you the ability to add links into each and every description for posts. You can use this to your advantage by directing viewers to your website or blog post. A shortened version of the url via a bitly link will get the most clicks. Certain images sizes work better than others. 735 pixels wide by 1102 pixels tall has been proven to be the best size and ratio for Pinterest Images. Create a template in Photoshop or another photo editing software to ensure that each image is the perfect size. Dan Zarrella did a study on a sample of 11,000 images on Pinterest, and he found that taller images had the most repins. Group boards are great to participate in, but they are also great to start yourself. You can create boards and then invite the most active pinners to contribute. This will increase the amount of people that see all of the content in the board, and your profile. With rich pins, you can now pin your business products and include a direct link to purchase. Use this as much as possible to promote your business and brand. Madewell does an exceptional job promoting their clothing via rich product pins. Each rich product pin adds the product’s price and lists if it is in stock. 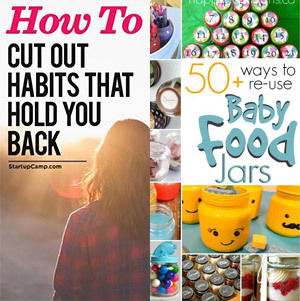 If you over clutter an image with too much text and graphics, you will blend into the Pinterest grid. By incorporating white space into your images, your pins will stand out and get more engagement. Studies have shown that photos with a small amount of text directly on the image get better results. This is because people are more likely to share a post that clearly says what it is about. Keep a close eye on your stats. By monitoring the analytics of your posts, you can expand upon trends that are driving the most repins and referral traffic. When I switched my blog over to rich pins I was able to use Pinterest analytics to quickly see that it had made a huge difference. Pinterest allows you to organize your boards however you would like. Drag and drop your most popular boards into that top row to showcase your best pins to new visitors. The total number of users someone follows. The overall number of pins that the account has. The number of boards a person has. The amount of pins created within the DIY and Crafts category. The amount of pins created within the Hair and Beauty category. The amount of pins created within the Design category. 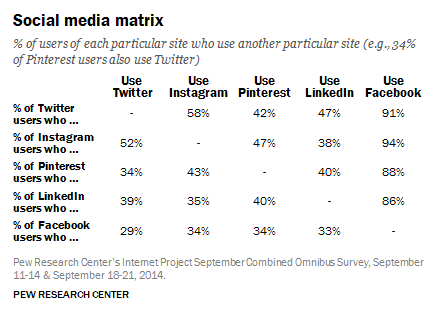 The most popular categories are where most pinners are spending their time browsing pins. It is a no brainer to consistently pin within these categories. 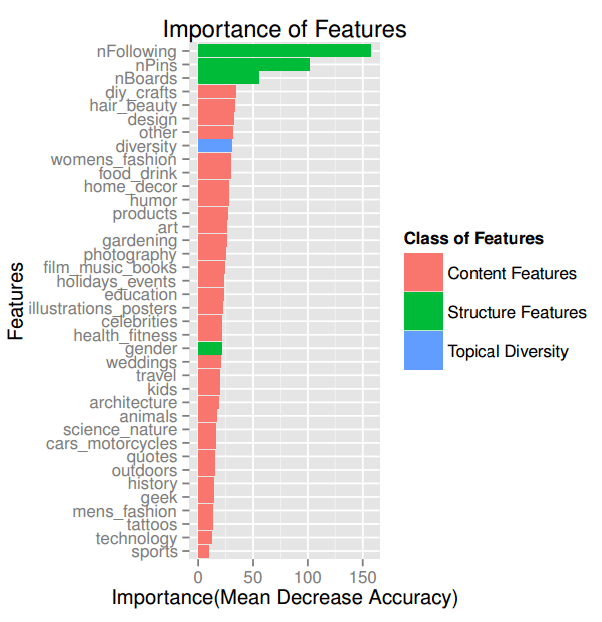 The same University of Minnesota study that identified influencing factors on an account’s total followers, also identified the 32 most popular categories on Pinterest. The top 5 categories singled out were Food and Drinks, DIY Crafts, Home Decor, Women’s Fashion, and Other. 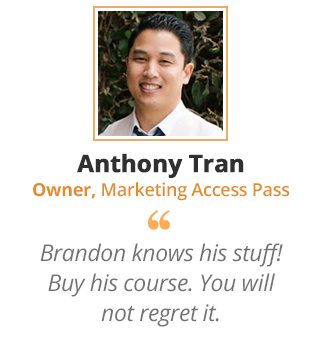 You are now fully equipped to turn your Pinterest account into a traffic referring machine. Please take a short moment to share this post on Pinterest and Facebook, so that you can be responsible for helping your followers get in on the Pinterest referral gold rush. If you have a blog or website, then you can use the infographic below in a post of your own. Just be sure to link back to this article somewhere within your post (go here to download the Pinterest infographic image to use).